Obamacare (ACA) holds all businesses and corporations responsible for supplying healthcare. If a business employs more than 50 full time workers, they are responsible for providing insurance or paying a penalty. If a company employs 25 people or less, tax credits are provided to subsidize coverage. 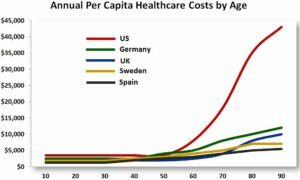 Seventy percent of all healthcare costs happen in the final fifteen years of an individual’s life, typically while under the umbrella of Medicare. Access to life-long preventative medicine is critical in lowering the government’s Medicare liability. Shifting coverage to private industry also lowers the government’s emergency room expenses which the uninsured use in place of primary care physicians. When an individual is not covered by an employer or as a dependent, they are responsible for their own insurance. Beginning in 2013, the government created a competitive vehicle where insurance companies meeting basic requirements can compete for business. Similar to websites Expedia or Lending Tree, once personal criteria is entered, insurers publish rates and the consumer can choose a plan based on price or benefits. Known as insurance exchanges, these launched nationally to help consumers make educated choices and provide a baseline for coverage comparison. Exchanges soften interstate requirements and prerequisites allowing for productive competition between insurance providers. Similar to existing employer-provided healthcare, a person’s individual policy allows access to preventative medicine. Even more important, individual healthcare allows small firms (fewer than fifty employees) to compete with the benefits of larger firms when attracting employees as benefits are universally. Since the bulk of uninsured individuals are under 35 years (65%), providing their coverage is critical to lowering costs for all private insurance companies, given their healthy age demographic. These younger, healthier participants are needed to offset high risk individuals, much like auto insurance or Medicare. Because the inclusion of low risk individuals is critical in driving down costs, it is imperative they sign up. One of the concerns is that uninsured individuals will forgo purchasing their insurance until they need it. At this point, the only penalty they will face is an $89 annual tax, which is not very persuasive. However, exchanges currently bending cost curves making health insurance affordable and attractive, overcoming this concern. On the government side, Obamacare (ACA) legislation mandated that State Medicaid programs cover individuals whose annual earnings fell within 133 percent of the Federal Poverty Level (FPL). The FPL currently covers at 100 percent, so the ACA provided funding to cover the increase; however, this mandate was struck down by the Supreme Court. Many states have opted out of expanding Medicaid, forgoing federal subsidies and leaving millions of their state residents uninsured, primarily for partisan reasons. While living in Arizona I watched the fight over Governor Brewer’s decision to expand Medicaid. Residents were fueled by misunderstanding and political manipulation working to forgo Federal subsidies to provide care for more of their working citizens. Combined, states rejecting Medicaid expansion lose out on $8.4 billion in federal funding, exclude coverage for 3.6 million uninsured, and see $1 billion more in uncompensated spending. Even more problematic, states rejecting expansion will see non-reimbursable emergency room and Medicare costs grow. Perhaps what opponents were politically afraid of is not the demise of the American healthcare system, but the potential success of Obamacare (ACA). In hindsight many of the partisan claims leading up to the law have been disproved and unsubstantiated. 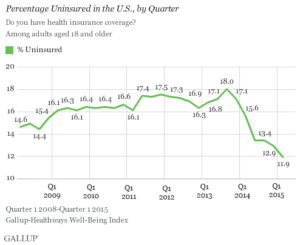 Healthcare costs are rising slower this past year than 30 years prior. 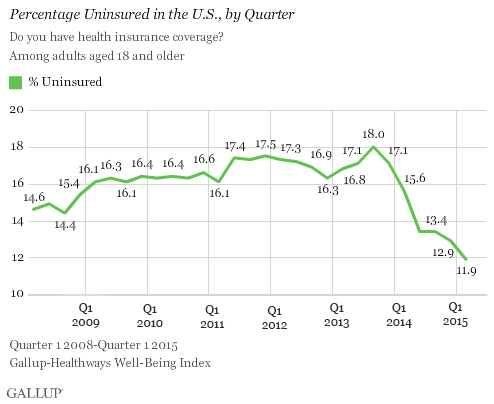 The uninsured rate has improved as more than 10 million people, who previously had no healthcare, now can visit a doctor. Popularity of the law is starting to swing back around as comprehension grows. And claims of a melting economy or diminishing job market have proven hyperbolic. Pre-existing conditions are no longer a barrier to coverage. Preventative medicine is included by every approved insurer saving billions of dollars on Medicare. Perhaps the biggest criticism is the expense of the Affordable Care Act (ACA). But according to the non-partisan CBO, Obamacare (ACA) is deficit neutral. If Obamacare was to be repealed, there would be no change to our annual deficit or national debt. Any additional costs associated with the law are offset primarily by scale and penalties paid by those unwilling to buy private insurance. In fact the latest projections by the CBO resulted in billions of budgetary savings over 10 years versus the system currently in place. Opponents also charge that Obamacare is a tax for those who remain uninsured. This is a fair statement; however the receipts collected will help offset emergency room liability for the uninsured that all taxpayers subsidize today. To understand our healthcare law, it is imperative to ask the right questions in order to open up honest debate. Obamacare (ACA) is a far cry from socialism; its main purpose is to reduce Medicare and uninsured emergency room expenditures through access to care. It uses tax penalties to push citizens away from government and into the hands of private insurance companies. Obamacare (ACA) also delivers improved quality of life due to access to health care, unattainable for most Americans due to cost — a significant benefit to society. 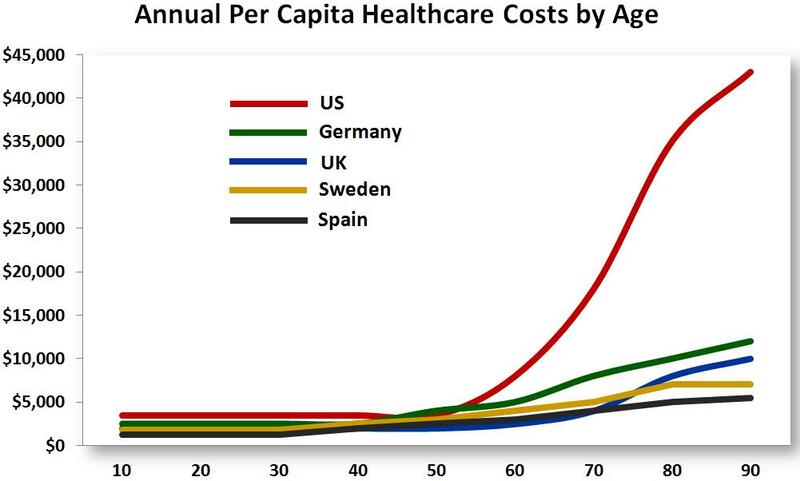 Finally the most compelling argument for the ACA was our inability to call the United States the greatest country when our healthcare expenditures are the highest and millions of our citizens lacked basic insurance coverage. The Affordable Care Act still needs revision, but it is a needed improvement over the previous status quo.